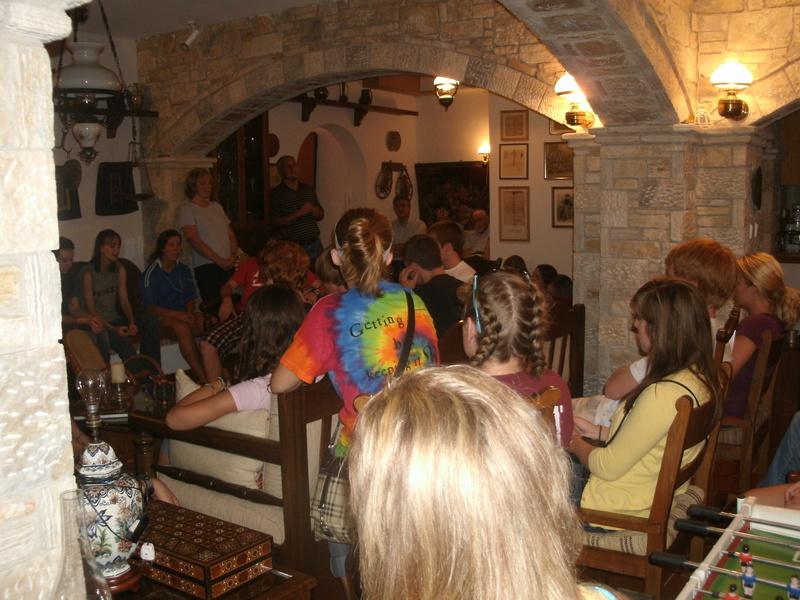 While the students continue to ask questions and learn about the Islamic faith, we will try to give you a taste of the adventure we had last evening. Vasilios Tsirbas is a lawyer in Athens who has helped Harding for over ten years. He was helpful in purchasing the Artemis Hotel and continues to provide legal and financial assistance. 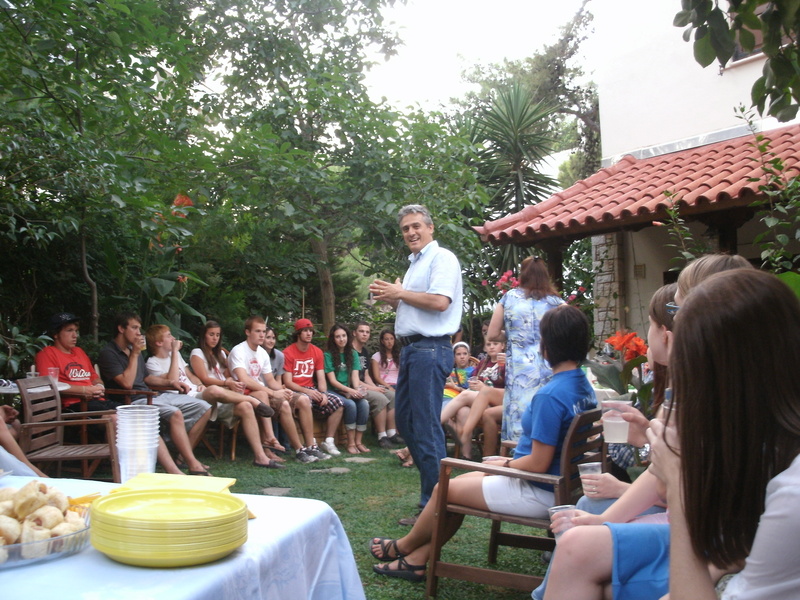 He has never invited a group from Harding over to his home but we were lucky enough to receive just such an invitation. His wife even offered to cook dinner, which we politely declined since our group consists of 36 students and 6 adults! His invitation probably had something to do with the fact that he and his wife, Natasha, have three teenage children. They all speak English very well and they were interested in their children being exposed to American teenagers, more specifically Harding, Christian teenagers. It was a very big responsibility for our group to be ambassadors and you better believe the mothers in us came out as we gave suggestions (warnings) as to how their behavior should be in this situation! We made a plan to arrive at eight for snacks and a devotional. 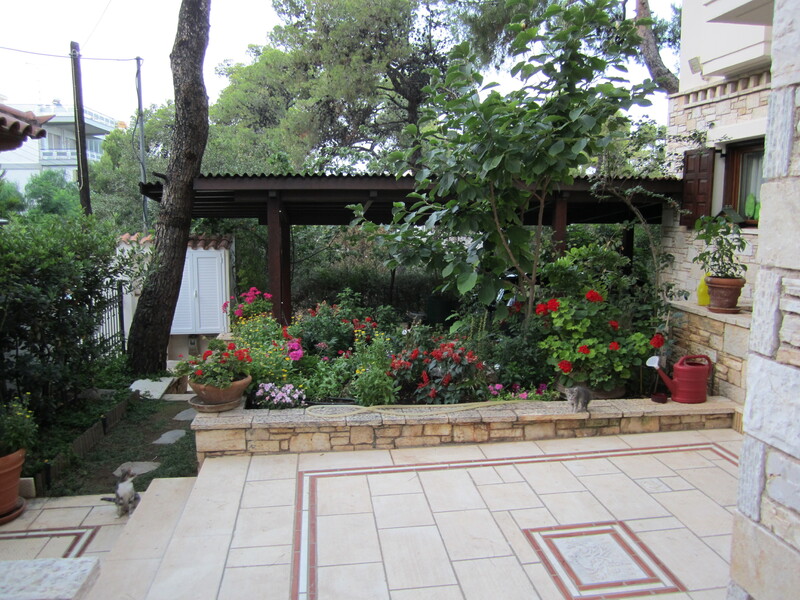 When we arrived, we were warmly greeted by Vasilios and Natasha and their family. They had set up several chairs around the edge of their side yard. It was very lush and green with a lemon tree in the corner where we saw Natasha sneak away at one point and pick a few to replenish the lemonade. A large table of food was set out and another table of beverages. She had set out coke bottles with ice (remember ice is very western so we haven’t seen that much) and a very refreshing punch complete with an ice mold of edible leaves and flowers to keep it cold. She explained that the food she had made was both Greek and French. She also had a French brownie and a Greek apple pie. My favorite were the cold desserts she brought out later. One was a strawberry yogurt, jello mold with fresh strawberries all around it and another a chocolate pudding sauce she again served with strawberries. Vasilios had printed out a sheet for everyone of “Interesting Facts about Greece”. He spoke for a few minutes and was both enlightening and entertaining. After his talk, we enjoyed eating the refreshments and playing with the three little kittens their dog had adopted. Their children were very friendly and moved about easily helping their mother and visiting with the students. 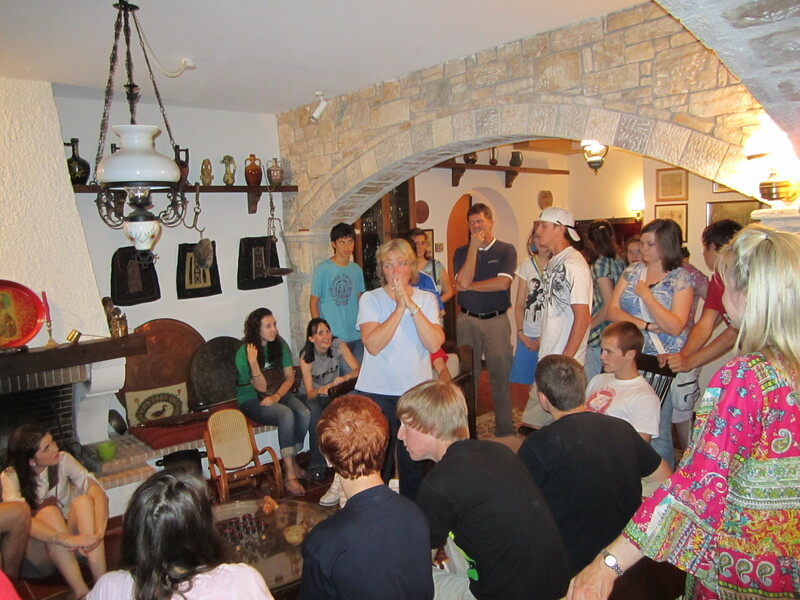 We eventually moved downstairs to their basement where an impromptu group game and devotional ended the night. The acoustics were really good in the basement and we drew the attention of Natasha’s parents who live on the third floor. They came down to greet us and listen. We were pleased to see some friendships developed between their children and our students. The students seemed to really enjoy themselves and several came up to thank them as we were leaving. We just finished a lunch of fresh green beans, marinated pork chops and baked breaded potato. There were very few left-overs. The laundry is all clean and we have been prepped for our departure for Turkey. We have decided that out of respect for Turkish customs and for safety reasons that we will be wearing pants or long skirts for the remainder of our touring time, i.e. no shorts. This decision was met with a few sighs but all came to an understanding especially after we heard from Vicky, the receptionist, who grew up right outside Turkey and is in her fourth year of learning the Turkish language. Freetime this afternoon may involve some thrift shopping in the local shops! 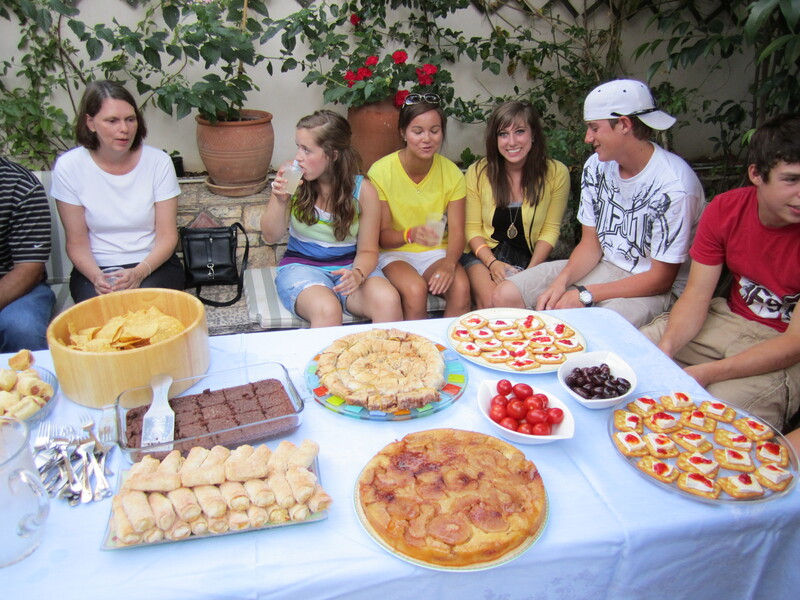 First, it’s wonderful that everyone was able to experience your evening in a real Greek home with family and food carefully and thoughfully prepared with you all in mind. What a special experience to have been so honored! Second, my mind can’t help running back to those gray skirts in an earlier post…are they in a pile somewhere? They’re probably long gone. My mom has a friend who went to Turkey and thought it was so very interesting–loved learning about a culture foreign to ours. She also came back with some beautiful jewelry, so keep your eyes peeled! Ha! Loved the scenery from the climb in the last post. So thrilled that you ALL are having this wonderful summer in Greece. Looks like all is going very well! Soak it up! Thanks for the tip about the jewlery! We will be looking! I just wanted to take a minute to thank you for the terrific commentary on your trip and the photos. Peter is probably rather typical for a teenage boy–“It was great. I loved it.” That’s all; no details and no pictures. I do know he has learned a lot and is excited about being in Searcy this fall. Thanks again for everything. I have passed this on to Katie’s grandmother for her to see what the kids are getting to do. She loves it. This was a neat ideal, thank you very much Amy . Its good to know what they are doing and getting to see. I have gotten to speak to her just about everyday and she is having an awesome time. This will be something they will never forget. Prayers are with all of you for a safe trip into Turkey. It is a real treat, particularly with a large group like that, to get invited into a home. It sounds like there was a lot of prep to get them ready for a special outing, which is also great. It had to be a special experience for their teens as well. I am very interested to see how the group, and particularly Jennifer, react to Turkey after the time in Greece. It so close yet its such a different experience. I am certain they will get into the shopping. Hopefully they have saved some money and some luggage room.